Our Pinch Technology Studies identify all possible energy savings available at a site and their corresponding financial benefits. Since 1995, American Process has applied specialized energy cost minimization techniques to industries such as pulp & paper, ethanol, petrochemicals, steel, kaolin, textiles, and waste-to-energy. We have completed over 350 energy integration studies and identified annual energy savings opportunities of over one billion dollars. American Process boasts the world’s largest experience list for the application of Pinch Technology to industry. 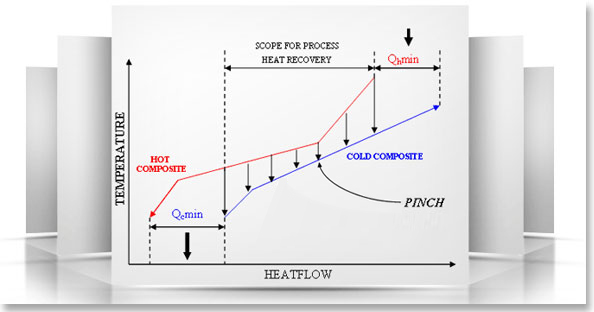 Pinch Technology is a systematic, thermodynamics-based analysis of industrial processes that defines the minimum amount of thermal energy needed to run the facility and identifies the best way to reach this usage level through operational changes and heat recovery projects. Our Pinch Technology Studies identify all possible energy savings available at a site and their corresponding financial benefits. At American Process we have revolutionized the way Pinch analysis is applied to industry. Water Close™ and O-Pinch® (Operational Pinch), were developed as American Process Inc add-in methodologies to traditional Pinch technology. They are used to identify water savings opportunities (WaterClose™) and operations-based energy saving opportunities requiring low or no capital cost (O-Pinch®).